A winter race that will show your real character. 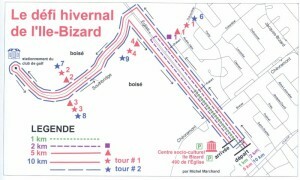 Come and run in L’Île-Bizard to beat the hill and run on a unique course with your family. Please note: due to the weather, this race has no water station on course. Medals to the first three in each category in the 1 km / 2 km / 5 km / 10 km, male and female. Visit the General information page for the age group tables. You can pick-up your bib number on race morning at the registration desk. Race kits will be organized in Alphabetical order to facilitate distribution. A reminder that if you are racing in more than one event, you MUST wear the correct BIBTAG (number) for each distance. Click here for all courses maps. 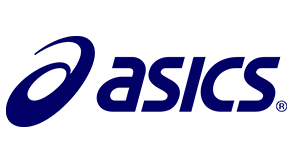 Option 2: By Mail: you can contact the race director to receive an entry form. Your entry form must be received 14 days before the event. Option 3: Race Day: Registration available from 7:30AM on race day, closing 30 minutes prior to each event. Our goal is to increase pre-registration to 90%. On the Trans-Canada Highway (Highway 40), take Exit #52 “Boul.St-Jean north”. Turn left on Blvd. Pierrefonds, right on Jacques Bizard street and cross the bridge. Once on the island, take a left at the 2nd intersection (Blvd. Chèvremont), then a left on De l’Église street. Parking is very close. Bus Route #207, from the Fairview Centre terminal, stops in front of the Centre socio-culturel. 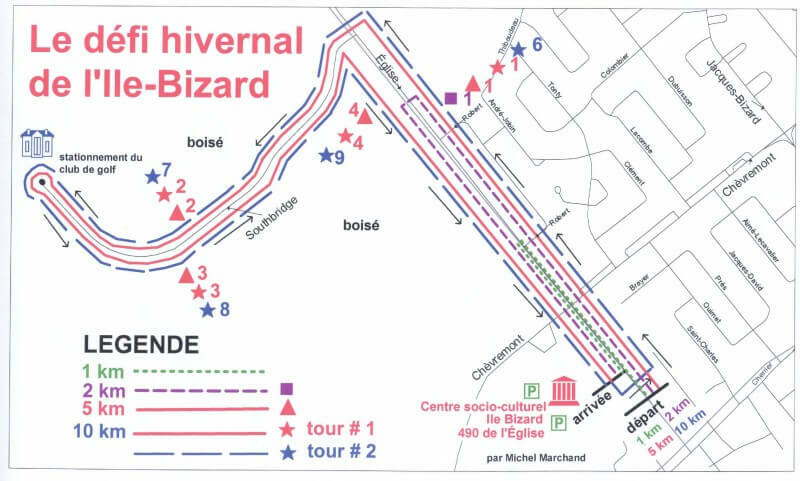 Free parking is available at all time beside the Ile Bizard Cultural Center and the Vincent Lecavalier Sport Center.